Well, I have been slacking on my promised post with more about Sock Summit. 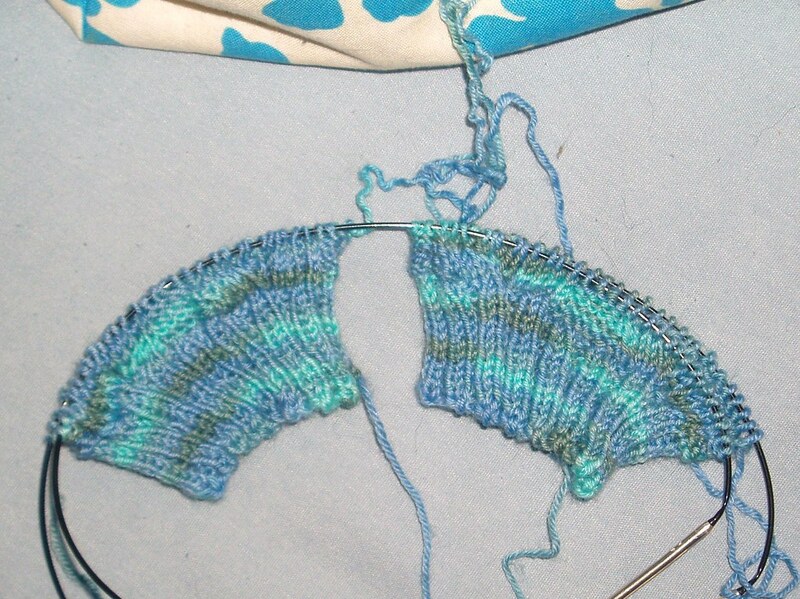 The problem, you see (other than all the secret knitting keeping me busy) is that I have camnesia. It’s a horrible disease where I bring my camera to Sock Summit yet take pretty much no pictures. It’s true, I have a couple of pictures of my socks in progress and a few more of food. That’s it. So I borrowed some from Shannon Okey. 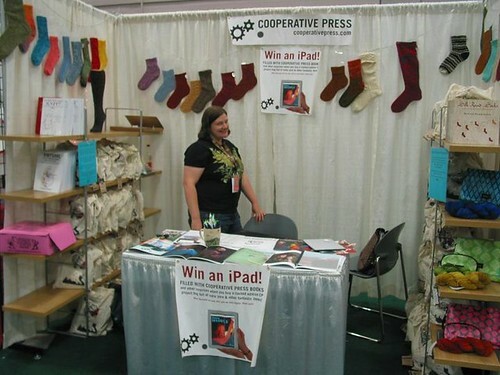 Here’s Shannon’s picture of me in the Cooperative Press booth. It’s not a great picture of me, but I spent lots of time in the booth, and I helped hang up all those socks. Plus, it proves I was actually at Sock Summit. Of course, my eyes are closed. 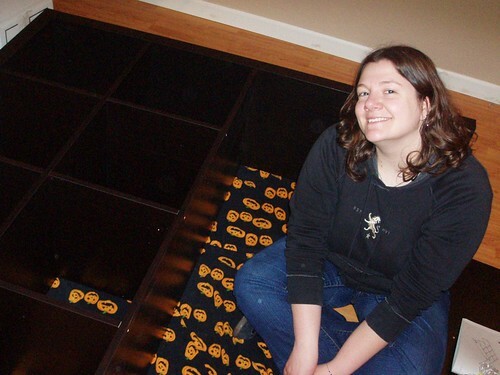 Maybe there’s a reason there aren’t more pictures of me at Sock Summit! 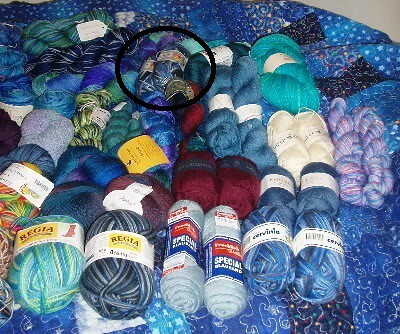 And further proof… my friend noticed that I am visible in Harry’s (Franklin’s ball of sock yarn) Sock Summit adventure video. I’m trying to squeeze out of the Goth Socks booth at about 2:14 in the video. Just in case you were wondering, I still like blue. The two on the right are the same, I’m hoping to knit some gothy knee socks. While I was photographing yarn, I thought I’d give you a sneak peek of some of the yarns that are going to be in my book – some of them are from Sock Summit, some aren’t. Well, this is a knitting blog, and so I shall talk about yarn. 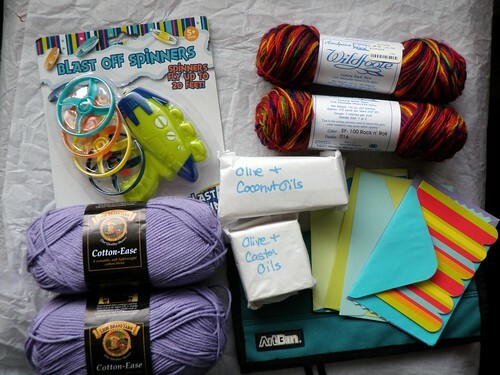 My pal sent me a couple skeins of Wildfoote, some handmade soap, notecards, a needle case, 2 skeins of Cotton Ease, and a “Blast Off Spinners” shooter thing. The last is for the cats – I haven’t tried it yet since I was a bad recipient and didn’t take a picture until today, but I’m sure they’ll enjoy it soon. And now for a bit more yarn talk… I’ve been using the end of my Summer of Stash to make sure all my sock yarn is up on Ravelry. 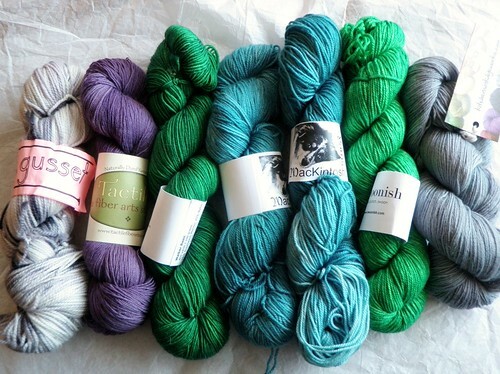 So no, I did not just buy all of that yarn that went up on Ravelry. For the most part it was from Sock Summit (yes, it took me a year to get it up on my stash) or yarn clubs, but a bit was from the yarn crawl in May. 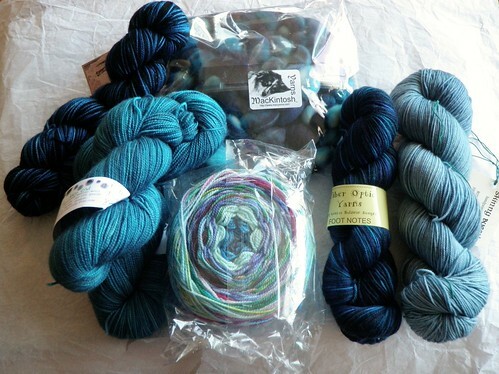 None of it was bought this summer, as I haven’t been buying yarn since June 21st. While I may buy the occasional skein once my stash commitment is over on the 23rd, I’m still going to stick to my 3:1 rule (using 3 times as much yarn as I buy). Yes, candy corn socks, here I finally come! 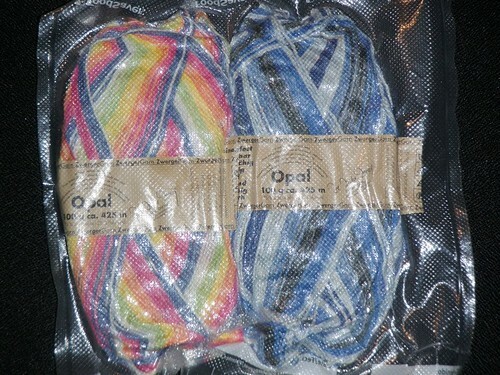 A while back I ordered some Opal Feelings yarn on eBay. I’ve wanted some – particularly the blue one – since it came out a couple years ago, and now that it’s gone I still wanted some. I’ve been waiting patiently for it to come in the mail. Well, the weather in Seattle has been particularly bad these past few days, and tonight when I arrived home I was getting my mail out in the rain (and in the dark, I hate you DST! ), I grabbed a package which I thought was a book that I’m also expecting. But upon bringing it to my apartment, I realized it was my yarn. Except… book shaped. That is a lot of stockinette. 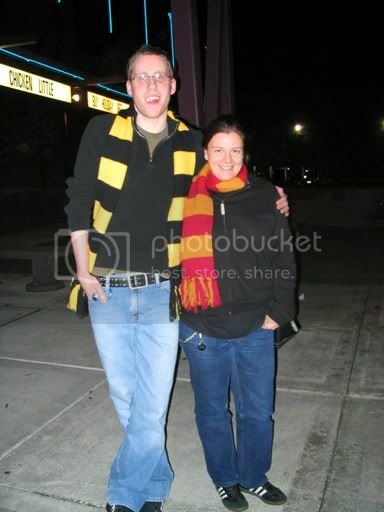 Even more than the first ones, because this scarf is longer. Whew! But it’s done and I think it turned out really well. It’s on the way to it’s new home and I hope she likes it! 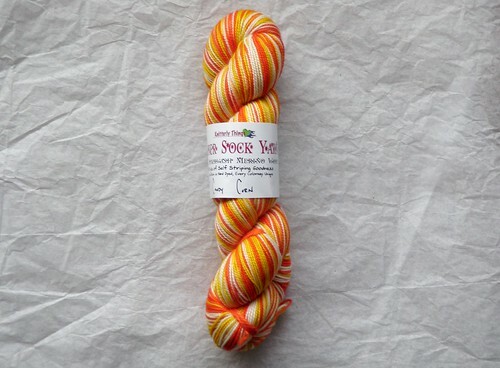 I posted this yarn in my stash on Ravelry one day, and Snarfy commented “OMG hot”. I almost thought it a joke because… well let’s just say this yarn is not really my style – but you could have guessed that. 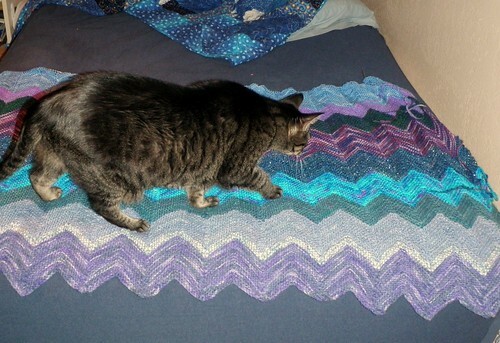 Of course, while I was knitting it I got comments both ways, so it seems that Snarfy isn’t the only one who really liked this yarn. I got it from the Woolgirl club, and it was destined to sit in my stash for all eternity… but then Snarfy rescued it. Since I hadn’t used Dashing Dachs before, I told her I’d knit the socks. The base yarn is that standard 2-ply merino that many indie dyers use or have used – I can’t remember the name off the top of my head, but it’s quite thin and rather loosely plied. It knits up nicely, though. Even though the colors weren’t my favorites, I have to say I’m impressed with the dyeing. The black is *very* black and most of the colors have pretty clear “borders” and don’t bleed into each other. The light blue does blend a bit with the bright green to make it a little bit of a darker green, but it looks good. And the bright green and yellow sort of fade into each other. But there aren’t any muddy spots where the colors touch, which I was really pleased with. * Overall a very nice yarn! Listening to: the menu music for Tru Calling… I’d better go finish my DVD! First off, if you haven’t seen this video of sheep-herding art, it really is a must see. And I am not someone who usually posts links to YouTube on her blog. I saw it on Shannon’s blog this morning and it is pretty amazing. And I haven’t seen it everywhere yet, so I figured it was worth posting. I’ve been working here and there on a few projects, but a lot of the knitting has been put aside in favor of apartment (and stash!) organizing. I know I’ve said it before, but it is sure great to have knitting friends. 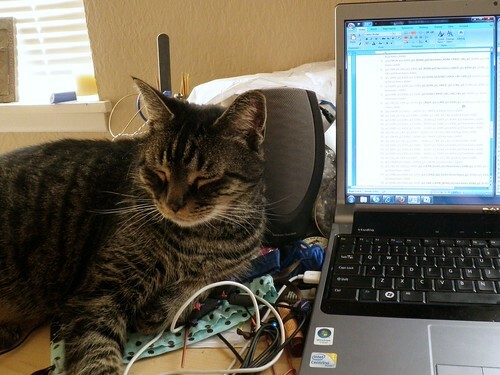 Especially knitting friends like MJ who knits with me on Skype and, occasionally, does crazy things like stay up til 4am (actually 6am her time) organizing yarn in my new Expedit on Skype. Yeah… But let’s rewind. Monday evening, as planned, I took a trip to IKEA with my buddy and partner in furniture acquisition, Brian. We made a really quick trip through IKEA and got most of the items on my list and magically fit it all into his Jetta. The Jetta totally wins. Now, granted, IKEA furniture is flat-packed, but we got a big (4×4) Expedit, a TV stand, 2 lamps, a drying rack, and a few assorted smaller goodies all into the back of his car. Then, after dinner, we got to put it all together. There are many reasons why I love Brian, but one of them is that he is a guy who reads directions when assembling furniture. 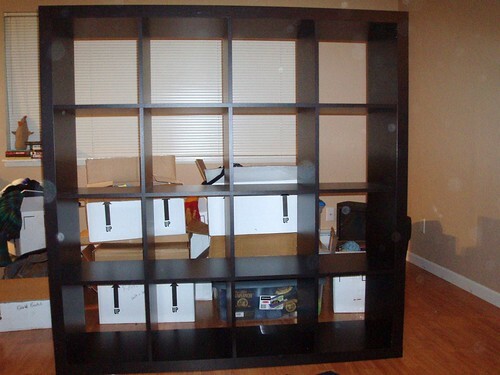 And I was so excited I kept exclaiming about how great my new Expedit was while it was still in pieces on the floor! I still have a few yarns to add to my Ravelry stash – some of the stuff I got right before moving from Boston didn’t make it in, and there was a bit of yarn acquisition in the intervening 6 months. 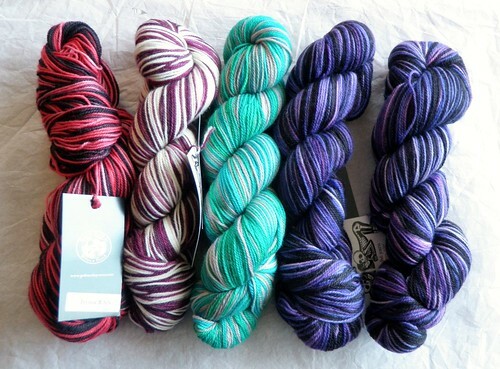 Also I’ve found that I’m really *really* bad at remembering to add my Rockin’ Sock Club yarns. Probably because of the whole spoiler issue, and then after a month I forget. I was going to show you some pictures of my socks-in-progress, but this post is already unwieldy so those can wait for another day. Yesterday the knitting group in Salem was having a yarn swap, so I gathered up a few less-loved colors of sock yarn and a bunch of odds and ends that weren’t sock yarn and headed out. 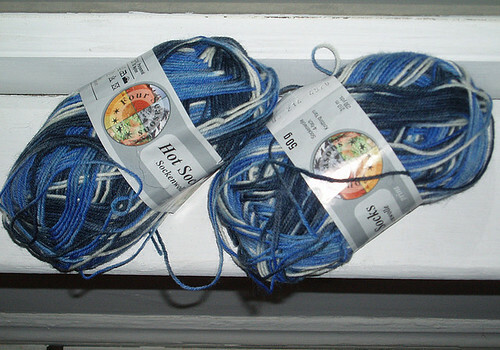 Not many people brought much yarn, but I did manage to make a couple swaps with the sock yarn for other sock yarn and offloaded a bunch of other yarn that was nice, but just not something I’m going to knit. I’ve realized that I really do knit socks *way* more than anything else, and I like it. I’ve tried to convince myself to knit other things, but the truth is I don’t often want to. So I’m embracing my sock-knitterness and paring down the non-sock stash. The best part about this is that my Stasholution is now in the black. 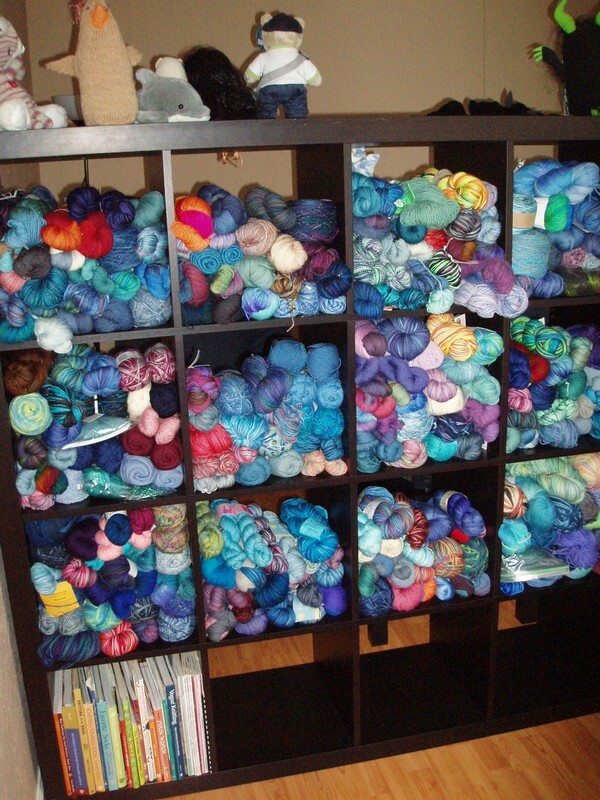 I have a stash rule that I can only bring in 1/3 the amount of yarn (measured in grams) as goes out. The “out” yarn is anything I destash or knit up. I was a bit in the red at the end of last year, but now as a result of this yarn swap I have a few new-to-me skeins of yarn and “credit” for 33.3g of yarn. Yeah, not even up to a skein yet. 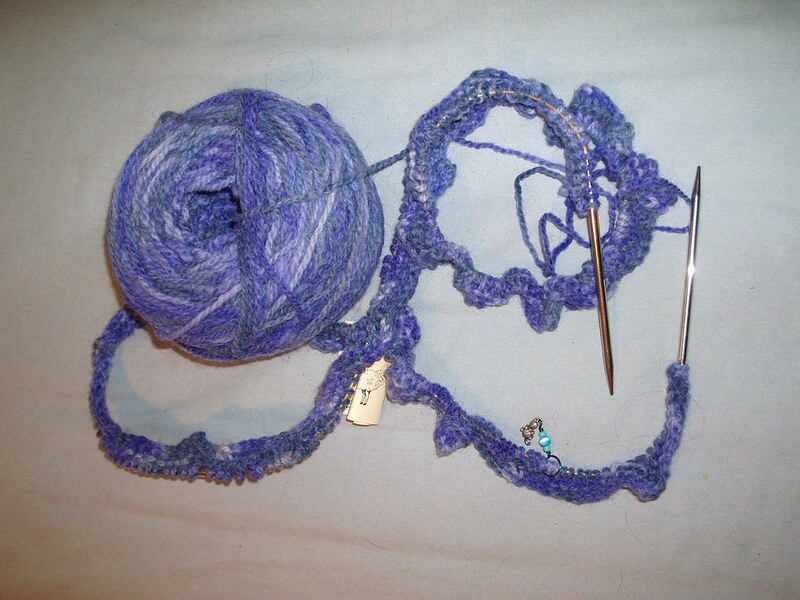 As for the knitting, these past few days have been all about the WIPs. 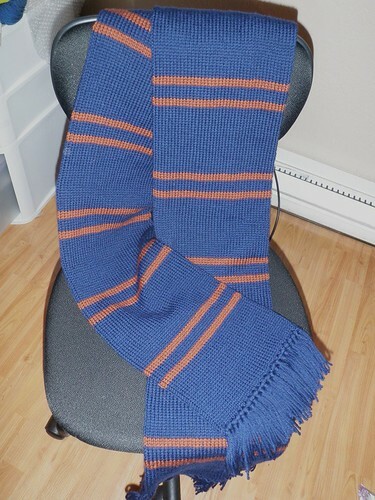 The second of the two scarves has been started and is threatening the progress on other WIPs – everyone wasn’t kidding when they talked about how addictive it is! Watching those little stripes form is so fun! And I hate 1×1 rib. I’m sure it will be even better when the colors change… you can see that the turquoise is starting to become green. I’m using colors 40 and 233. I’ve also be participating in the Leyburn KAL on Ravelry. A bunch of people in the Socks That Rawk!! 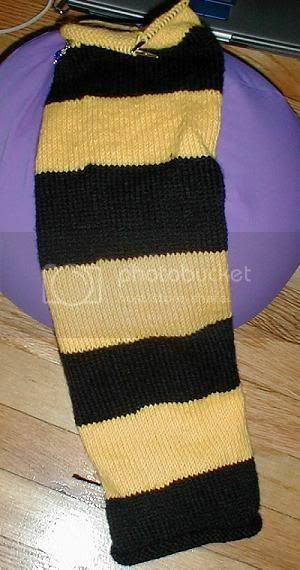 group are knitting this pattern in different colors of Socks That Rock – the idea is to get as many colorways as possible. Mine are in Carbon Dating. I changed the pattern to cuff down and had to mess with the numbers a bit to get them to fit, but so far I think they’re going really well. 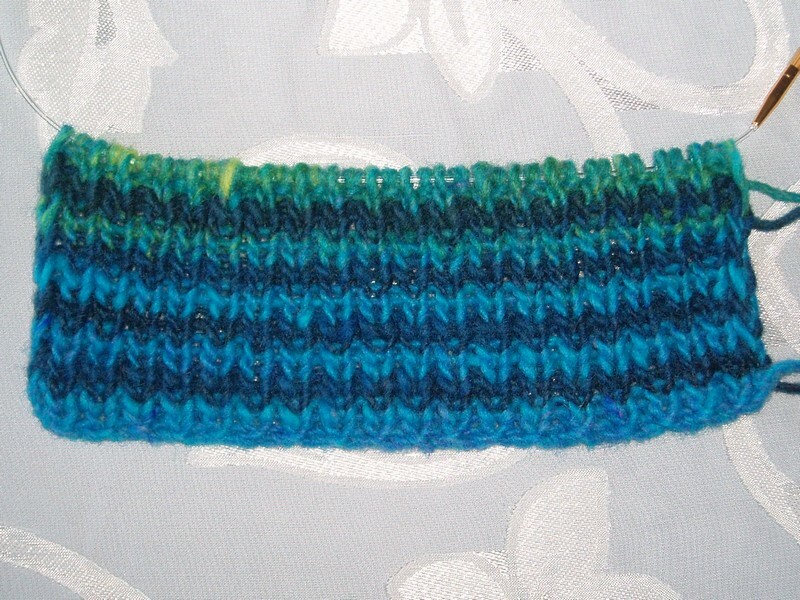 It’s an interesting pattern, but very easy to memorize and fun to knit. I should have a couple finished projects this week if all goes well, and neither of them are pictured above. So, as I said in the last post, that wasn’t all of my casting on frenzy. Freeing up those size 1 needles allowed me to rescue these little toes which had been hanging out on 2.5mm needles for a few months. (And that was after being the Reversi socks for Sock Madness which I just didn’t like and ended up frogging) I started the toes intending to do the Jacobean socks while coming home from sock camp last April (I know, I know…) but since toe-up socks aren’t my favorite and I needed my size 1s for much more pressing sock concerns… well they got neglected. Now that the size one needles are free they’re back in action using the Anastasia Socks pattern that I’ve been meaning to make for about forever. Overall a success… so far. 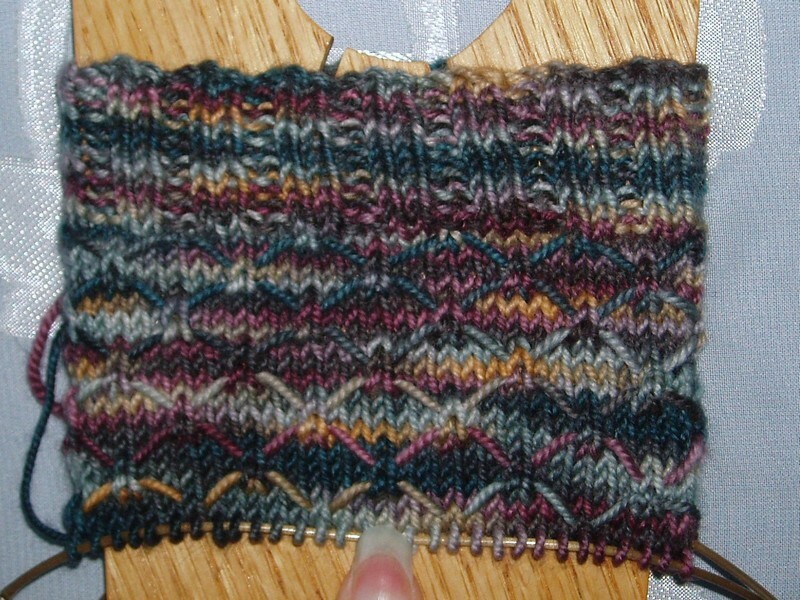 And of course getting the 2.5mm needles out of those toes allowed me to cast on for a much more important pair of socks! 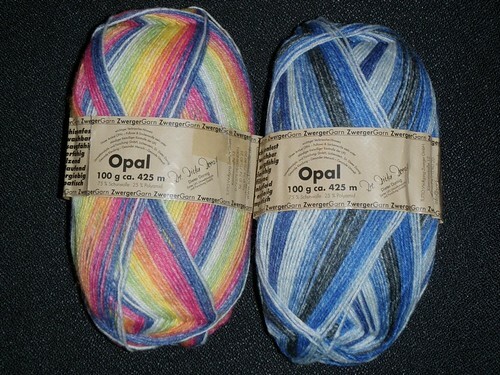 My friend Rachel bought this yarn long ago and I promised to make her socks with it. And I tried, really I did! 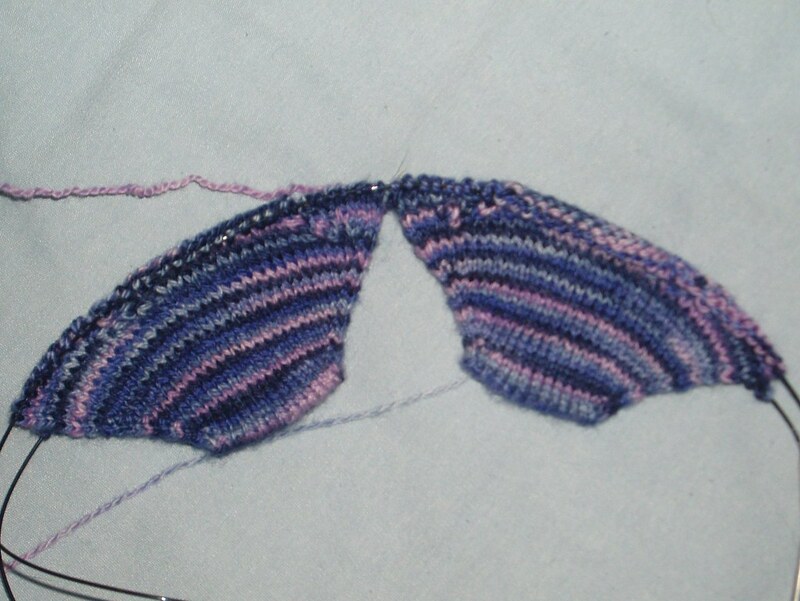 First I started the Canal du Midi pattern from Knitting On the Road, but I just hated knitting it so much I knew it would never get finished. 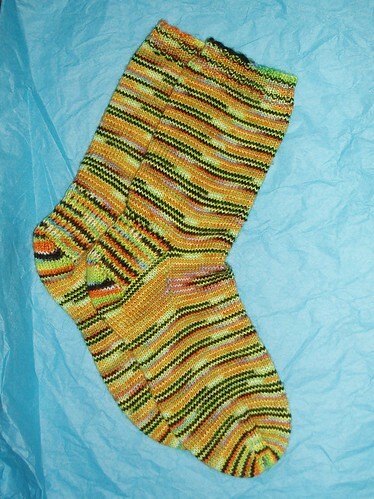 The socks sat around for about a year until I frogged them, then I moved 3 times in 2 months and the yarn got misplaced. I found it and started one of the patterns from Knitting Vintage Socks, I honestly don’t remember which one, but it also was not a winner. So now it’s been easily 2 or 3 years and Rachel is getting married in January and asked if I could pretty please make her the socks for her “something blue” and really, how could a friend deny a request like that? Especially since I’ve owed her these socks for years now and have made about 100 other pairs of socks in that time. I am really a bad friend. So I have started the Monkey pattern which is perfectly mindless and never fear, the socks are already much farther than when I took this picture a couple days ago. I thought up this project quite a while back as a solution to all my gorgeous 1 or 2 balls of worsted-ish weight yarns in blue and purple. I got many of them as gifts from the many secret pal swaps I participated in, and a girl can only use so many hats. Plus, as you may have noticed, I don’t knit many hats. These are really beautiful yarns from Lorna’s Laces Worsted to Colinette to yarns from little farms across the US – and they really deserve to be used. 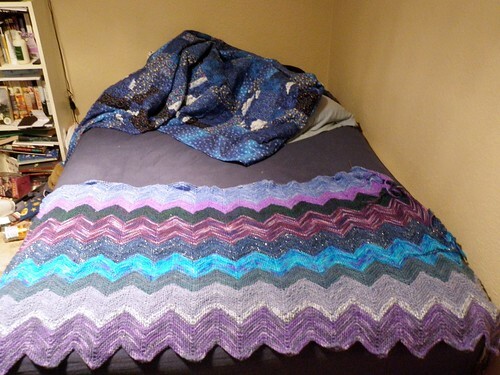 So I came up with this idea… I could knit a blanket in a chevron pattern with all these yarns, since they are all blue and purple and go well together. I can knit up what I have and add to it when I get special gift balls of yarn, and if I start doing SP swaps again I can ask for yarn for it too. I had the forethought to buy the needles a few months ago so it was all ready to go, and after casting on 299 stitches (eek!) I’m off! Knitting has been largely preempted by moving lately. It’s no fun, but it’s the way it has to be. I started packing and one of the first things to get packed was most of my stash. I’ve decided that if I pack all of my yarn I’ll be less likely to start new projects and more likely to finish knitting the things I already have in progress. I’ll save out a ball or two for the road trip but otherwise all the stash is being boxed up. 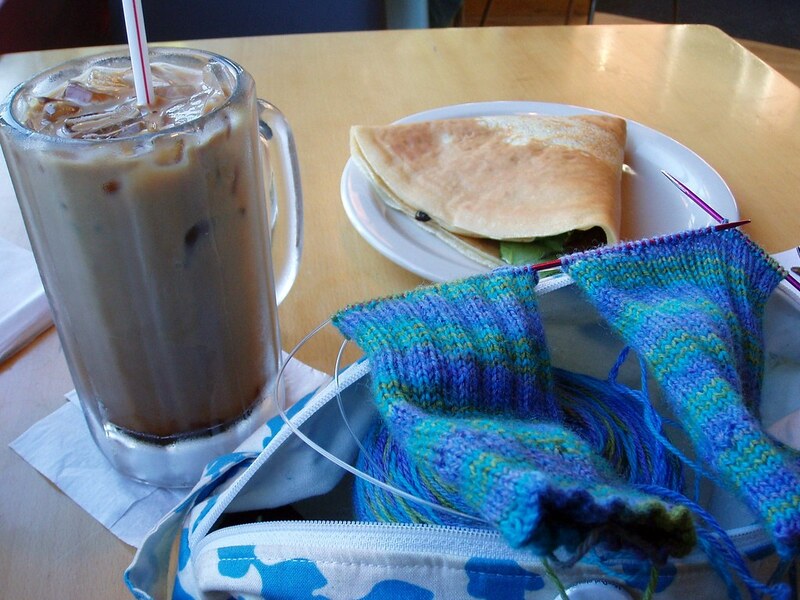 Tonight I went out to meet polarg for an evening of knitting and crepe eating. It was lovely. Doesn’t it look perfect? It was an awesome way to get my mind off of the moving at least temporarily.